I Didn't Know THAT Would Happen! My youngest is getting older. He will be eight on Easter. Only two more years and he will be in the double digits. I sometimes wonder how it will be without a "little kid." I have had them around for so long, it is odd to think about not having any. He already does not allow me to hug him if people can see and will only hold my hand to cross the street only in the busiest of crossings. He is growing up. I am happy to see he is growing into a self-reliant and strong person. As his Mom, I try not to hold too tight or too long. He is doing what he should be doing. I am loving every second of it. I tucked him into bed two weeks ago ( tucking in is still allowed) and realized that his bed is full of quilts made when he was younger. Two by me and one by Thomas Knauer. They are all his and he knows it. His absolute favorite is one I made from inexpensive Joann's flannel. 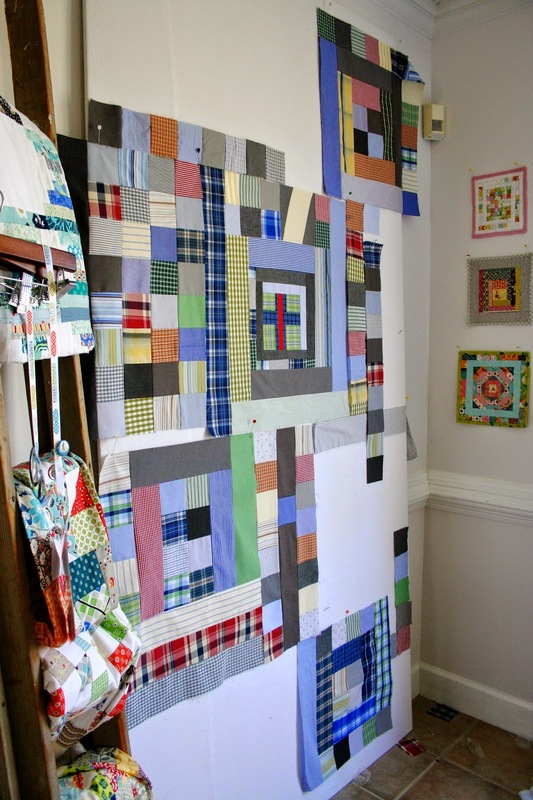 A simple patchwork. Bright and colorful. Just like him. He still asks for it when he does not feel well to cuddle and soothe himself. "I didn't know THAT would happen!" That is a kind of joke in this house because when the older boys would be told NOT to do something and then they would do whatever it was anyway ( they are boys) when the "bad" then would happen they would always say, "I didn't know that would happen!" No one gave me that warning, so when I went to make the simple patchwork for the soon to be eight year old, I happily made my huge mess of to be blocks and then went in another direction. Not because I had a better idea, because honestly, I did not. I made a few other log cabins with bits and pieces and had tried to stay only with basics. My heart was pulling me in another direction. I was up early today starting a new center block and it happened! The thing that no one warned me about. This may appear to be a simple nothing of a plus block but it is really so much more. The one strip of red is an odd random piece of the Red Quilt that I made last year. I have no idea how it decided to place itself in my path but it did. I had made an effort not to make this a complicated process but I wanted to try something different. This is different. 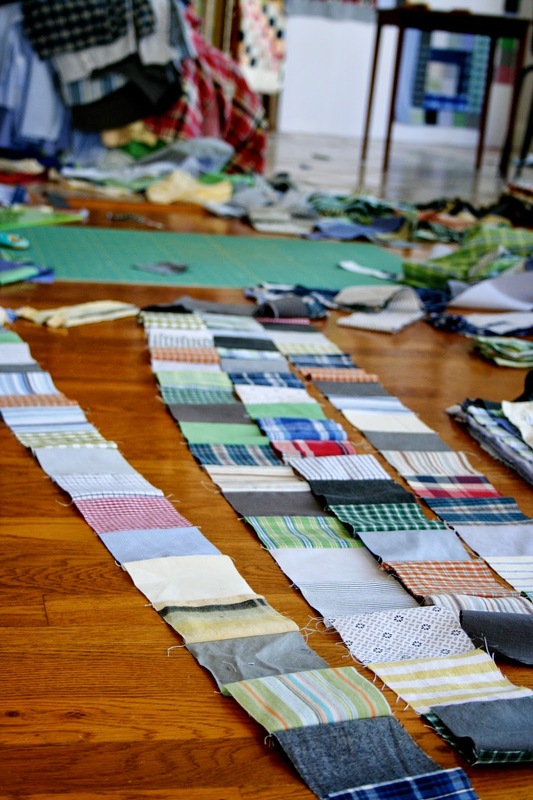 In Adam's quilt there will be a log cabin with a tiny red strip of something that means a lot to me. The quilt just became very personal. This will be a great quilt and really, "I didn't know THAT would happen!" Sometimes the best laid plans are best laid aside and letting chance throw you a fabulous curve ball! Love projects like this - sometimes the fabric, or the moment, takes us on a very different path - but probably one more memorable then where we started out. I always say my stash will tell me what it wants to become. I think yours just did. Ah, but that's the wonderful thing about art--it knows what it wants! And since the Heart of a person does, too, they occasionally hook up and demand your attention. And after all, isn't that why we listen? That block will sing to you every time you see it and (believe me about this one) as you get older it will have even more meaning. Life really is wonderful and mysterious and worth every moment of hurt and pain and love and laughter and all the other feelings it brings. Easter Blessings! Very sweet post and this is the crux of quilting to me - the discovery and joy to be found when least expected!